Wishes really do come true with this magical new nail polish collection for Winter/Holiday 2014! 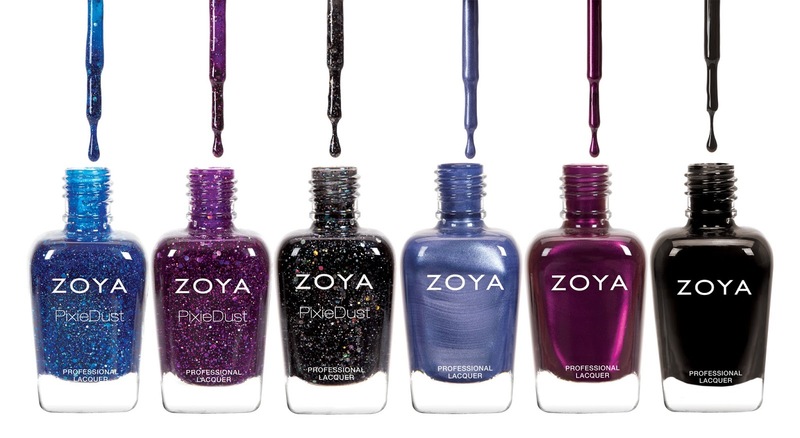 Zoya Wishes is a densely pigmented assortment featuring both traditional and Magical PixieDust formulas in coordinating color combinations that can be worn alone or combined into stunning combinations, no matter how you wear them, this collection delivers a fanciful way to celebrate the season! NORI: Sapphire blue Magical PixieDust* with holographic hex glitter, perfect for any holiday festivity. THEA: Deep amethyst Magical PixieDust* with an orchid flash, packed full of party-ready holographic hex glitter. IMOGEN: Black crystal Magical PixieDust* with holographic hex glitter, just add an LBD and you’re off! PRIM: Velvet blue metallic, with a full coverage, high-density pigment and buttery smooth application. HAVEN: True holiday plum liquid metal with a thin vein of orchid for added brilliance. WILLA: Full-coverage, onyx black cream. Pre-orders begin on October 20th, 2014, with shipping beginning November 1st, 2014. Standard colors retail for $9, while PixieDust shades will retain for $10. Available in top salons, spas and on zoya.com.